#533 Main Street. Circa 1840. One of the first land severences made by Benajah Williams was in July 1840 when property was deeded to the Methodist Episcopal Trustees for a church and burial ground. There is no record of anyone being buried on site since the land is so close to the river, but a wood frame church was built and used for services until 1903. In 1903 the church was renovated and brick walls were added directly overtop of the existing wooden structure. 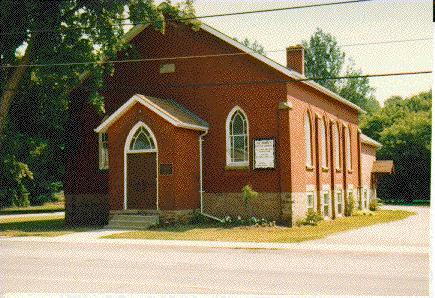 The Methodist Church became part of the United Church of Canada in 1925. The building is presently the St. John's United Church. This photo is one in a series of Glen Williams, Main Street inventory. Photography by Eric Connolly.